Leo Tolstoy once called him the greatest of American writers. 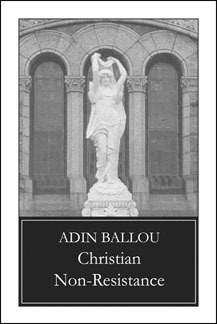 Yet by the time he died in 1890, Adin Ballou had been largely forgotten in his own country. His vision of a world in which nations would glory not in military might but in "superior justice, forbearance, meekness, forgiveness, charity" was dismissed as a relic of the naïve and sentimental optimism of pre-Civil War America. The power of nonviolent resistance was recognized inthe twentieth century, and Christian Non-Resistance is now recognized as an important contribution to the theory of nonviolent resistance. Ballou's combination of the utmost moral resistance to evil with the uninjurious physical restraint of evildoers provides a conceptually simple, flexible approach to the problem of resisting evil without becoming evil oneself.